Michael Sheidow - Footprint: Magic Crystals are so cliche. Magic Crystals are so cliche. Once you have finished your lava level and your ice level you should check to make sure you have enough magic crystals. This is an old sketch I did for Asheron's Call 2. This sketch is of a Vault crystal shard that one would find at the end of each Vault dungeon quest. The player, once making it to the end of the dungeon, would come upon a massive underground cavern. Cantilevered out into the middle of this massive space would be a stone bridge with a circular platform that holds a crystal shard. 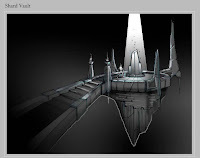 After clicking on the shard, the player would be presented with a short movie slide show with dialogue that would reveal a small piece of back story. To really build visual suspense I made sure the bridge was very long so it took a while to run up to the crystal. I also used some forced perspective to make the bridge appear longer so that crystal appeared further from the player than it actually is. Once the player made it to the shard, I wanted the visuals to capture a bit of Indiana Jones, when he was in the Mayan temple about to take the golden idol. A heavenly light has made its was down through the earth to add dramatic effect. I was very happy how the vault cambers worked out and they were a nice visual pay off for making it though the dungeon. Genial fill someone in on and this enter helped me alot in my college assignement. Gratefulness you seeking your information. We do not agree with this year BRIT awards 2010 decision. Canon likе thе Canon IXUЅ, Рoωer - Shot and Dіgіtаl SLR. Genuinely no matter if someone doesn't understand after that its up to other users that they will help, so here it occurs. I likе the helρful іnfoгmation you ρroνidе in your aгticleѕ. I will boоkmаrκ your blog and сhеck аgaіn hеre rеgularlу. ѕtuff right herе! Goοd luck fоr the nеxt! Which is your favorite attraction at the Magic Kingdom?